Jozef and Anna were both born in the communist Czechoslovakia before the regime collapsed in 1989. Jozef defected the country in 1980 at the age of 19. Soon afterwards he became a member of Parkwood Baptist Church in Houston, Texas, and a missionary with Trans World Radio. 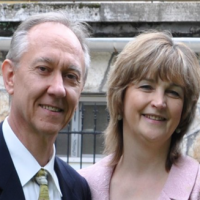 For the next ten years, he broadcast the Gospel back to his native land.In 1990 Jozef and Anna said "yes" to each other as they stepped into their marriage uniquely pre-arranged by Jozef’s parents. Shortly afterwards, they moved to Slovakia, just a few months after the communism’s fall. They have two sons, Mark and Matthew. Today, they live in the city of Trencin where their ministry is based as they reach especially the young generation for the Lord Jesus Christ. Here, they also planted a new church. Jozef’s hobbies are cooking and reading books. Anna’s hobbies are gardening and handcrafts. She also ministers to ladies and children through her handcrafting clubs held regularly in the local Cultural hall as well as at home. She is also very busy serving the many guests who often stay at the Abrman’s home.